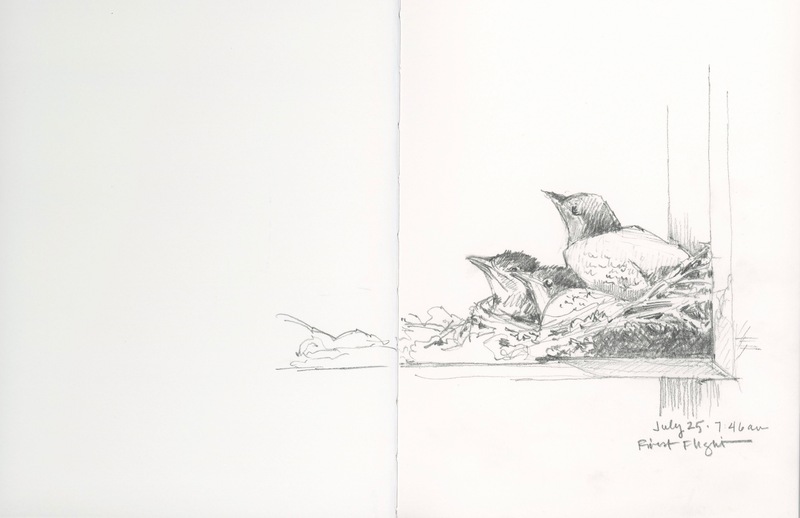 This entry was posted in Birds, Journal, Nest and tagged birds, nature, nests, sketchbook by Jean Mackay / Drawn In. Bookmark the permalink. How wonderful! to be fledging together!! A most “moving” story! And, I’d say, certainly a good omen! All the best in your move. Well said! Thanks for the good wishes! They grow so fast! Other birds take longer in the nest, but for most small songbirds, two weeks is about it. So very beautiful. I just love birds. I had a nest in my tree, but it was too high to really see the babies. That nest and the babies and the momma sure endured some really bad storms, and a lot of rain here in Northwest Florida. It’s amazing how strong those nest are, and how dedicated the momma is to protect her little babies. This is the first nest I’ve really been able to see into for an extended period. It’s been great! It is amazing what can sometimes happen when we take the time to simply sit and observe. The sketch is wonderful. So true! I’m so glad I made time to sit still for a few minutes. Lovely to be able to draw this from life! I agree– quite a privilege. This is the first nest I’ve ever really been able to see all the way into and observe over a period of days. It’s been great! Thanks much Evelyn. Sometimes the quick ones turn out the best. Thanks Evelyn! The other two birds flew off today, so I’m glad I pulled out the pencil when I did! Congratulations – one of many sketches at your new place, hopefully. And it’s a beauty! Yes. Our new home is in a lovely rural setting– so much here to draw. I can’t wait to jump in! Since I am from upstate New York, and have artistic ties to Western New York, (my grandfather is Charles Burchfield) I’m curious where you have moved to. The countryside of WNY has an amazing subtle beauty! Wow–Charles Burchfield! Responding more via email. Last night I went to a remarkable presentation by Jennifer Ackerman on her book, The Genius of Birds. Your bird drawings get me to contemplate bird lives the way Ms Ackerman’s book slows me down to think of their amazing adaptability. P.S. – send pics of your new house… at least a quick sketch. I haven’t read her book, but I LOVE the cover. I’ll share pics soon, but you should visit. We love our new digs! Enjoy your new (old) house. And what a great moment!